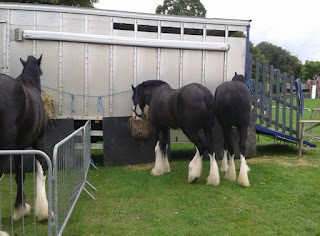 The summer months are a busy time for me as, in my day job, I attend a lot of agricultural shows, horse shows, food festivals and the like, both local and national. One of my favourite events is the Aberaeron Cob Festival, which takes place right in the centre of this picturesque west Wales town every August. It is a showing of the Welsh breeds rather than a competition, so there are no prizes, though many of the horses there are regular prize winners in such prestigious events as the Royal Welsh Show. The last two years, I've been lucky enough to have a ringside view of a packed programme, including the running of the magnificent stallions, the neck-breaking Welsh Mountain Pony Grand National, the Gentle Giants team of beautiful black shire horses, and the heart-stopping antics of the Galloping Acrobatics. Many years ago, I spent several seasons working with horses and, although I rarely ride these days, it seems I've never quite lost the love of this noble and beautiful animal. But whether you're a horse lover or not, it is an entertaining day out that is well recommended. Another plus side to my job is that I get to work four days on and then have three days off for writing, which is what I'm doing this week. Having started something new recently, and after a slow and not-quite-certain beginning, things are becoming a bit more fluid now. My characters are starting to become real to me and - more importantly - to each other, and the storyline is taking shape nicely. I've only got one and a half chapters down so far, so a long way to go yet, but as always I've set myself a deadline for a partial submission in the autumn. And, although the sunshine is glorious this morning and it seems that summer will last forever, I suspect that October will be here before I know it!